Collaborative learning has a strong presence in technology-supported education and, as a result, practices being developed in the form of Computer Supported Collaborative Learning (CSCL) are more and more common. Planning seems to be one of the critical issues when elaborating CSCL proposals, which necessarily take into account technological resources, methodology and group configuration as a means to boost exchange and learning in the community. The purpose of this study is to analyze the relevance of the CSCL planning phase and weigh up the significance of its key design components as well as examining group agreement typology and its usefulness in team building and performance. To do so, research was carried out using a non-experimental quantitative methodology consisting of a questionnaire answered by 106 undergraduate students from 5 different CSCL-based subjects. Results prove the usefulness of the planning components and the drafting of group agreements and their influence on group building and interaction. 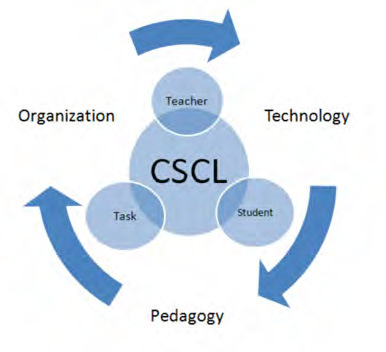 In order to ensure the quality of learning, it is essential to plan CSCL initiatives properly and understand that organizational, pedagogical and technological decisions should converge around a single goal which is to sustain the cognitive and social aspects that configure individual and group learning. It is evident that human beings join communities in an attempt to reach certain goals or ideals. The relationships that make the group stay together are esta blished to a large extent by the interaction required to pursue common goals; in the case of learning communities, it is to achieve the learning objectives. In a review of the literature we find considerable evidence that social interaction contributes to effective learning (Hiltz & al., 2001). Rodríguez-Illera (2001) points to several psychological and anthropological approaches covering this non-individualistic conception of learning: situated, shared or distributed cognition, social constructivism, activity theory or the sociocultural approach (Vygotski, 2000). Even so, it is necessary to differentiate between the traditional conception of group work and the ongoing collaborative work perspective, where the emphasis is on the idea of «built knowledge» (Scardamalia & Bereiter, 1994), which refers to the interaction and reflection process that allows the group to configure meanings together (Guitert, 2011; Harasim & al., 2000; Johnson & John son, 1999). The advantages of collaborative work for learning at different stages, such as academic, psychological and social benefits, are broadly covered in many studies (Johnson, Johnson & Holubec, 1993; Roberts, 2005; Slavin, 1985). Collaborative work also improves transversal competences in team work (Guitert, 2011; Hernández-Sellés & Muñoz-Carril, 2012), and au thors note the twin effect of «collaborating to learn and learning to collaborate» (Rodríguez-Illera, 2001: 64). Collaboration is perceived as one of the distinctive characteristics that are necessary for learning in virtual environments (Garrison, 2006; Harasim & al., 2000; Kirschner, 2002; Palloff & Pratt, 1999; Román, 2002). Dillenbourg (2003) even states that collaborative work is one of the dominant features in technology-supported education, hence the relevance of CSCL-based practical work. However, initiatives for group work do not guarantee good collaborative work (Brush, 1998; Dillenbourg, 2002). Stahl, Koschmann and Suthers (2006) refer to the risk of assuming that students know how to work in groups and that they will collaborate spontaneously. Technology itself, no matter how so phisticated, is not enough since the tools themselves do not propose a model or promote a particular dynamic (Onrubia & Engel, 2012). Therefore, any proposal for online collaborative learning requires technological as well as pedagogical and social aspects to be taken into consideration. a) It is necessary to begin with an initial reflection on competences and objectives before deciding on methodology (Rubia, 2010). Therefore, there is a need to identify the CSCL contribution regarding generic, transversal and subject competences and to establish the relationship between method and objectives. On the other hand, a good system aligns both teaching and assessment methods with the learning activities included in the objectives, and so each element in the system supports student learning. b) Methodology and task type need to be coherent. As for task type, Escofet & Marimon (2012) relate procedural, analytical and problem-solving tasks to collaborative learning, pointing out that learning is significant when it entails the resolution of a complex task that requires various actions and decisions. Gros & Adrián (2004) also relate collaborative work to problem resolution, project deveopment or discussion interactions, emphasizing the need to assign group roles and the tutor’s role as a guide who guarantees collaboration. c) It is necessary to generate resources with information that will communicate the collaborative model to the students, together with its phases and pedagogical objectives. Recently, authors such as Dillenbourg and Hong (2008), Haake and Pfister (2010), Onrubia and Engel (2012) and Sobreira and Tchounikine (2012) have studied the idea of producing collaboration scripts that guide students to form groups, interact and collaborate in order to solve the task or problem. These scripts are also used as a means to establish a commitment between students and teacher, as well as to support task organization. On the other hand, Strijbos, Martens and Jochems (2004) suggest the need to systematize a model to communicate to students the type of interaction that is expected of them, and clarify the relation between task result and group interaction. d) It is necessary to decide group characteristics and define the group-building process, taking into consideration the drafting of the group agreement. It seems that the group-building process is decisive in fostering collaborative work and guaranteeing learning (Dillenbourg, 2002; Exley & Dennick, 2007; Guitert, 2011; Guitert & al., 2003; Isotani & al., 2009; Pujolàs, 2008). It is also necessary to estimate grouping endurance since stability in the group enhances the maturation process(Barberá & Badía, 2004; Guitert & al., 2003; Exley & Dennick, 2007) as well as the development of team work competences, particularly if there is effective guidance from the teacher (Her nández-Sellés, 2012). In the case of teacher-formed groups, Muehlenbrock (2006) points out that the perspective of grouping by characteristics is broadened in virtual environments due to the ubiquity of remote work. This is why it is necessary to take aspects such as location, time and availability into account. Webber & Webber (2012) determine that grouping through automatic mechanisms does not have a negative effect on collaborative work. In higher education, spontaneous grouping seems to imply greater commitment in task performance (Guitert & al., 2003). Several authors point out that heterogeneous grouping seems to lead to a deeper learning as a consequence of the contrast of different points of view and diverse leels of comprehension (Barberá & Badía, 2004; Felder & Brent, 2001; Guitert & al., 2003; Exley & Dennick, 2007; Pujolàs, 2008). Both students with a higher comprehension level as well as those less gifted benefit from collaboration. Different perspec tives and points of view also support learning. As far as group size, authors seem to agree on five members since more can limit some member’s contributions and less than five students might diminish in teraction variety. Exley & Dennick (2007) refer to the relevance of manifesting the fundamental goals of collaborative work and emphasize establishing some basic rules and defining an attitudinal and rational framework for colla boration; they also refer to the need to explain and clarify task and schedule distribution. Indeed, these au thors relate malfunctioning groups to inconsistent initial planning. Guitert (2011) and Guitert & al. (2003) refer to the importance of drafting group agreements in order to support the group consolidation phase. These agreements are useful for grounding an exchange system and for setting frequency of contact to guarantee that the intragroup contrasts relevant to the task are given a hearing. Regarding this matter, Pujolàs (2008) cites the team notebook which includes the group and members’ names, their roles and functions, rules, group planning, session diary and regular team re views. This author considers that each group member should have an assigned role and recommends role spinning. Gros & Adrián (2004) emphasize the need to assign group roles and highlight teacher guidance as a means to guarantee collaborative activity. As already stated the literature on collaborative scripts insists on the establishment of bases for internal organization, including group-building criteria, work planning and contact modality in order to stabilize efficient group interaction. a) To assess the relevance of the planning phase within collaborative work in a virtual environment. b) To estimate the scope of the key components of collaborative work design. c) To analyze the relevance of some previous organizational aspects and their influence on collaborative work. d) To identify the elements to be considered in the configuration of group agreements and assess their usefulness in group building and functioning. • Genre reveals significant differences regarding perception of collaborative work planning and the usefulness of group agreements. • The degree course studied and the year in which students are enrolled reveal significant differences regarding perception of collaborative work planning and the usefulness of group agreements. • Previous experience in face-to-face collaborative work reveals significant differences regarding perception of collaborative work planning and the usefulness of group agreements. • Previous experience in virtual learning shows significant differences regarding perception of collaborative work planning and the usefulness of group agreements. The research context entails a group of five subjects; two on the primary education Teaching degree course and three on the infant education Teaching degree course. They correspond to first-, second- and third-year courses and are taught in a blended modality at the CSEU La Salle (Madrid). The sample collected was of 106 questionnaires, representing 83.46% of the student population. All of these subjects implemented the same collaborative work design in coordination. This design was grounded in planning which included: 1) a statement that communicated the task in a guide to collaboration that contained its description, a justification of the collaborative work, description of milestones, tools, a proposal for drafting a written group agreement and a description of the foundations for the collaborative work with a framework outlining attitudes and team work skills; 2) Spontaneous student group building; 3) group agreement writing; 4) teacher review and feedback on group agreements prior to group interaction. In order to pursue the exploratory and descriptive intentionality of the study, the methodology selected was non-experimental and quantitative, in the form of a survey (Buendía, Colás & Hernández, 1997; Cohen & Manion, 1990; McMillan & Schumacher, 2005). A Likert scale questionnaire was designed for the purpose of data collection with a five-answer level scale. The results appear in Section II under the titlen «Organi zation and management of team work prior to task performance». This section includes three categories that appear in Table 1: «Usefulness regarding the planning process» (including 4 items); Usefulness of group agreements» (4 items) and «Group agreement writing» (7 items). The questionnaire was answered in a face-to-face class just before the end of the course. A non-probabilistic, accidental or convenience sampling technique was used (Cohen & Manion, 1990; McMillan & Schumacher, 2005) to count the informants according to their availability or accessibility. Statistical analyses were undertaken with the SPSS 19 program. In order to guarantee validity, the first version of the questionnaire went through a subject-matter expert content validation and was subjected to a pilot study. As for reliability, Cronbach’s alpha intern reliability index was used in all the three categories within the section. The coefficients obtained were a=0.859 for «Usefulness regarding the planning process», a=0.894 for «Usefulness of group agreements» and a=0.867 for «Group agreement writing». In order to address the research objectives and hypotheses, several statistical analyses were undertaken. Table 1 collects the descriptive analyses of the different items, including frequencies and percentages, as well as measurements of central tendency (mean) and dispersion (standard deviation). Non-parametric statistical tests were carried out later in order to contrast the significant differences between the variables analyzed. As far as the descriptive analyses are concerned, it appears that students consider every aspect of collaborative work planning and group agreement writing to be very useful. Indeed, the means are all above 4 (in a 5-point scale), except for «Connection frequency between team members» (3.90 mean) and «Planned strategies when a team member is not as involved as expected» (3.93 mean). The item that presents greatest variability is: «Connection frequency between team members», with a 1.073 standard deviation. For the contrast tests, taking into account that the variables considered are not normally distributed, non-parametric statistics were used: Mann-Whitney for two independent samples and Kruskal-Wallis for k independent samples. There are significant differences according to gender (at an asymptotic level) between male and female students. The former consider the following variables to be more useful in the planning process: «Access to guidelines for group organization» (p-value=.005); «Having clearly established work objectives» (p-value=. 002); «Accessibility to all the information about task and its progress collected in a document» (p-value=.000). On the other hand, there are significant differences regarding those elements considered to be particularly useful in writing the group agreement, since male students find some variables to be more useful than others, such as: «Planned strategies when a team member is not as involved as expected» (p-value= .024); «Selecting communication channels» (p-value= .001); «Role distribution and coordinator election» (p-value=.000); «Definition of work calendar» (p-value=.014) and «Task distribution between group members» (p-value=.047). Focusing on the «degree» and «year» variables, there appear to be no significant differences except for the item: «Access to guidelines for group organization» (p-value=0.20). Students on the Infant Education degree course as well as those in the first year rated this item higher. As for the experience as a student in virtual environments (online or blended), Table 2 shows how mean rankings are higher, in general, when students have experienced learning in virtual environments for two or more years. It is curious that these same students find the different elements related to planning collaborative work to be more useful. It is also worth commenting that contrast statistics following the Mann-Whitney U reveal that those students with previous experiences in face-to-face collaborative work processes consider the planning process to be more useful than those who had never experienced collaborative work methodologies. As for «Useful ness of group agreements», the only variable where there have been significant differences is «To support an effective work process» (p<.005). It is a very valuable exercise to collect the opinions of those students who have experienced a collaborative work methodology in a virtual environment, both to analyze the opportunities and challenges offered by CSCL as well as to see where future research can lead in terms of the weaknesses that emerge which have to be dealt with, and to identify those elements that need further exploration. Considering the design of CSCL, the results show the usefulness of the diverse components of planning, and it is worth pointing out that those students who place more emphasis on the design phase were those who had previous experience in face-to-face collaborative work and a broader exprience of online learning. In this sense, the drafting of the group agreement is considered very useful. Another important aspect is that «Connection frequency between team members» and «Planned strategies when a team member is not as involved as expected» are considered less useful in the group agreement writing phase, maybe due to the fact that they refer to a personal commitment and imply a possible penalty. This may be awkward to include in the document that will form the basis of future group relationships. In any case, these are aspects worth exploring in detail in the future. The answer of those students who had recently experienced collaborative learning confirm other au thor’s reflections –already cited– which claim that collaboration can lead to learning. This means the appropriate planning of collaborative work in such a way to build common bases within groups (grounding) for understanding, and to overcome obstacles such as low rates of participation and involvement (Kirschner, 2002). The collaboration-learning binomial cÇreates interesting opportunities –on a personal, group and social level–, but at the same time they have profound implications that entail a reconsideration of the pedagogical, organizational and technological elements configuring a virtual learning environment. These reflections should be made on an institutional level (Bates & Sangrà, 2011) as well as within subject design and curricular development. Online learning processes occur on two decision levels. On the one hand, they are linked to the curricular frame in which the topic is involved, and therefore relate to established organizational conditions as well as to pedagogical guidelines or a selected pedagogical model, and to the technology available in the institution. On the other hand, at the micro level in the classroom they are linked to the role of teacher and students and the specific activities promoted. The interrelations of all these factors inevitably condition the potential to teach and learn and, furthermore, that teaching and learning are possible through cooperation. Figure 1 aims to highlight the complexity of these interrelations. As Sangrà (2010) states, the big investment in technologies made by higher education institutions should support innovation and promote improvement in learning by overcoming traditional models. One of the means to encourage innovation processes in higher education, connecting technology, pedagogy and organization, is by making the diverse possibilities of collaborative work in online education come true. At a micro level, in every classroom situation, CSCL involves a change in the role that teachers and students have traditionally adopted. Teachers need to broaden their role as expert to incorporate others such as: planner, technologist and facilitator (Muñoz-Carril, González-Sanmamed & Hernández-Sellés, 2013). Students need to abandon their passive and receptive role so common in teacher-centered models, and take on a type of work that requires them to take responsibility for collaborating in unstructured tasks with multiple possible responses (Escofet & Marimon, 2012; Gros & Adrián, 2004). It is essential to design these tasks and particularly to elaborate detailed scripts including responsibilities, written documents on process and group agreements to support the group’s correct functioning and to guarantee the adequacy, effectiveness and sustainability of CSCL proposals. This will not only support academic learning but promote the social dimension and the sense of community. There fore, pedagogy, organization and technology also need to support the generation of an appropriate learning environment where it is possible to cultivate feelings of connection, to facilitate the so-called social presence and boost relations that humanize the virtual environment (Chapman, Ramondt & Smiley, 2005; Garrison, 2006; Picciano, 2002). Caring for the social aspects in collaborative learning and analyzing how it is possible for the two decision levels mentioned to support them constitute a key element in CSCL configuration and a challenge for research in the field (Pérez-Mateo & Guitert, 2012). Barberà, E. & Badia, A. (2004). Educar con aulas virtuales. Madrid: Antonio Machado Libros. Bates, A. & Sangrà, A. (2011). Managing Technology in Higher Education. San Francisco: Jossey-Bass. Brush, T. (1998). Embedding Cooperative Learning into the Design of Integrated Learning Systems: Rationale and Guidelines. Educational Technology Research and Development. 46 (3), 5-18. Buendía, L., Colás, M. & Hernández, F. (1997). Métodos de investigación en Psicopedagogía. Madrid: McGraw-Hill. Chapman, C., Ramondt, L. & Smiley, G. (2005). Strong Community, Deep learning: Exploring the Link. Innovations in Education and Teaching International, 42 (3), 217-230. (DOI:10.1080/01587910500167910). Cohen, L. & Manion, L. (1990). Métodos de investigación educativa. Madrid: La Muralla. Dillenbourg, P. & Hong, F. (2008). The Mechanics of CSCL Macro Scripts. International Journal of Computer-Supported Collaborative Learning, 3(1), 5-23. Dillenbourg, P. (2002). Over-scripting CSCL: The Risks of Blending Collaborative Learning with Instructional Design. In P.A. Kirschner (Ed. ), Inaugural Address, three Worlds of CSCL. Can We Support CSCL? (pp. 61-91). Heerlen: Open Universiteit Nederland. Dillenbourg, P. (2003). Preface. In J. Andriessen, M. Baker & D. Suthers, (Eds. ), Arguing to Learn: Confronting Cognitions in Computer-Supported Collaborative Learning Environments (pp. 7-9). Kluwer: Dordrecht. Escofet, A. & Marimon, M. (2012). Indicadores de análisis de procesos de aprendizaje colaborativo en entornos virtuales de formación universitaria. Enseñanza & Teaching, 30 (1), 85-114. Exley, K. & Dennick, R. (2007). Enseñanza en pequeños grupos en educación superior. Tutorías, seminarios y otros agrupamientos. Madrid: Narcea. Felder, R. & Brent, R. (2001). FAQs-3. Groupwork in Distance Learning. Chemical Engineering Education, 35 (2), 102-103. Garrison, D.R. (2006). Online Collaboration Principles. Journal of Asynchronous Learning Networks, 10(1), 25-34. Gros, B. & Adrián, M. (2004). Estudio sobre el uso de los foros virtuales para favorecer las actividades colaborativas en la enseñanza superior. Teoría de la Educación, 5. (http://campus.usal.es/~teoriaeducacion/rev_numero_05/n5_art_gros_adrian.htm) (02-04-2013). Guitert, M. (2011). Time Management in Virtual Collaborative Learning: The Case of the Universitat Oberta de Catalunya (UOC). eLC Research Paper Series, 2, 5-16. Guitert, M., Giménez, F. & al. (2003). El procés de treball i d’aprenentatge en equip en un entorn virtual a partir de l’anàlisi d’experiències de la UOC. (Document de projecte en línia. IN3, UOC. Treballs de doctorat, DP03-001). (www.uoc.edu/in3/dt/20299/20299.pdf) (02-04-2013). Haake, J. & Pfister, H. (2010). Scripting a Distance-learning University Course: Do Students Benefit from Net-based Scripted Collaboration? International Journal of Computer-Supported Collaborative Learning, 5 (2), 191-210. Harasim, L., Hiltz, S., Turoff, M. & Teles, L. (2000). Redes de aprendizaje. Guía para la enseñanza y el aprendizaje en red. Barcelona: Gedisa. Hernández-Sellés, N. & Muñoz-Carril, P.C. (2012). Trabajo colaborativo en entornos e-learning y desarrollo de competencias transversales de trabajo en equipo: Análisis del caso del Máster en gestión de Proyectos en Cooperación Internacional, CSEU La Salle. REDU, 10 (2). (http://red-u.net/redu/index.php/REDU/article/view/422) (05-04-2013). Hernández-Sellés, N. (2012). Mediación del tutor en el diseño de trabajo colaborativo en Red: resultados de aprendizaje, vínculos en la comunidad virtual y desarrollo de competencias transversales de trabajo en equipo. Indivisa, 13, 171-190. Hiltz, S., Coppola, N., Rotter, N., Turoff, M. & Benbunan-Fich, R. (2001). Measuring the Importance of Collaborative Learning for the Effectiveness of ALN: A Multi-measure, Multi-method Approach. Journal of Asynchronous Learning Network, 4, 103-125. Isotani, S., Inaba, A., Ikeda, M. & Mizoguchi, R. (2009). An Ontology Engineering Approach to the Realization of Theory-driven Group Formation. International Journal of Computer-Supported Collaborative Learning, 4 (4), 445-478. (DOI:10.1007/s11412-009-9072-x). Johnson, D. & Johnson, R. (1999). Aprender juntos y solos. Aprendizaje cooperativo, competitivo e individualista. Buenos Aires: Aique. Johnson, D., Johnson, R. & Holubec, E. (1993). El aprendizaje cooperativo en el aula. Barcelona: Paidós. Kirschner, P.A. (2002). Three Worlds of CSCL. Can We Support CSCL. Heerlen: Open University of the Netherlands. Lebrun, M. (2004). Quality Towards an Expected Harmony: Pedagogy and Innovation Speaking Together about Technology. Networked Learning Conference. Université Catholique de Louvain. (www.networkedlearningconference.org.uk/past/nlc2004/proceedings/symposia/symposium5/lebrun.htm) (05-04-2013). McMillan, J. & Schumacher, S. (2005). Investigación educativa. Madrid: Pearson Addison Wesley. Medina, R. & Suthers, D. (2008). Bringing Representational Practice from Log to Light. Proceedings of the 8th International Conference for the Learning Sciences, 59-66. Muehlenbrock, M. (2006). Learning Group Formation Based on Learner Profile and Context. International Journal on E-Learning, 5(1), 19-24. Muñoz-Carril, P.C., González-Sanmamed, M. & Hernández-Sellés, N. (2013): Ped-agogical Roles and Competencies of University Teachers Practicing in the E-learning Environment. The International Review of Research in Open and Distance Learning, 14(3), 462-487. (www.irrodl.org/index.php/irrodl/article/view/1477/2586) (12-04-2013). Oakley, B. Felder, B., Brent, R. & Elhajj, I. (2004). Turning Student Groups into Effective Teams. J. Student Centered Learning, 2(1), 9-34. Onrubia, J. & Engel, A. (2012). The Role of Teacher Assistance on the Effects of a Macro-script in Collaborative Writing Tasks. International Journal of Computer-Supported Collaborative Learning, 7(1), 161-186. (DOI:10.1007/s11412-011-9125-9). Palloff, R. & Pratt, K. (1999). Building Learning Communities in Cyberspace: Effective Strategies for the Online Classroom. San Francisco: Joseey-Bass. Pérez-Mateo, M. & Guitert, M. (2012). Which Social Elements are Visible in Virtual Groups? Addressing the Categorization of Social Expressions. Computers & Education, 58, 1.234-1.246. (DOI:10.1016/j.compedu.2011.12.014). Picciano, A. (2002). Beyond Student Perceptions: Issues of Interaction, Presence, and Performance in an Online Course. Journal of Asynchronous Learning Networks, 6(1), 21-40. Pujolàs, P. (2008). Nueve ideas clave. El aprendizaje cooperativo. Barcelona. Graó. Roberts, T. (2005). Computer-Supported Collaborative Learning in Higher Education: An introduction. In T. S. Roberts (Ed. ), Computer-Supported Collaborative Learning in Higher Education. (pp. 1-18). Hershey: Idean Group Publishing. Rodríguez Illera, J.L. (2001). Aprendizaje colaborativo en entornos virtuales. Anuario de Psicología, 32(2), 63-75. Román, P. (2002). El trabajo colaborativo mediante redes. In J.I. Aguaded & J. Cabero (Eds. ), Educar en Red. Internet como recurso para la educación. (pp. 113-134). Málaga: Aljibe. Rubia, B. (2010). La implicación de las nuevas tecnologías en el aprendizaje colaborativo. Tendencias Pedagógicas, 16, 89-106. Sangrá, A. (2010) (Coord.). Competencias para la docencia en línea: evaluación de la oferta formativa para profesorado universitario en el marco del EEES. Madrid: Ministerio de Educación, Programa Estudios y Análisis (EA2010/0059). (http://138.4.83.162/mec/ayudas/CasaVer.asp?P=29~~443) (16-04-2013). Scardamalia, M. & Bereiter, C. (1994). Computer Support for Knowledge-building Communities. Journal of the Learning Sciences, 3 (3), 265-283. Slavin, R. (1985). Learning to Cooperate, Cooperating to Learn. Nueva York: Plenum Press. Sobreira, P. & Tchounikine, P. (2012). A Model for Flexibly Editing CSCL Scripts. International Journal of Computer-Supported Collaborative Learning, 7(4), 567-592. (DOI:10.1007/s11412-012-9157-9). Stahl, G., Koschmann, T. & Suthers, D. (2006). Computer-Supported Collaborative Learning: An historical Perspective. In R.K. Sawyer (Ed. ), Cambridge Handbook of the Learning Sciences. (pp. 409-426). Cambridge: Cambridge University Press. Strijbos, J., Martens, R. & Jochems, W. (2004). Designing for Interaction: Six Steps to Designing Computer-Supported Group-based Learning. Computers & Education, 42, 403-424. (DOI:10.1016/j.compedu.2003.10.004). Vygotski, L. (2000). Historia del desarrollo de las funciones psíquicas superiores. Barcelona: Crítica. Webber, C. & Webber, M. (2012). Evaluating Automatic Group Formation Mechanisms to Promote Collaborative Learning. A Case Study. International Journal of Learning Technology, 7(3), 261-276. (DOI:10.1504/IJLT.2012.049193).